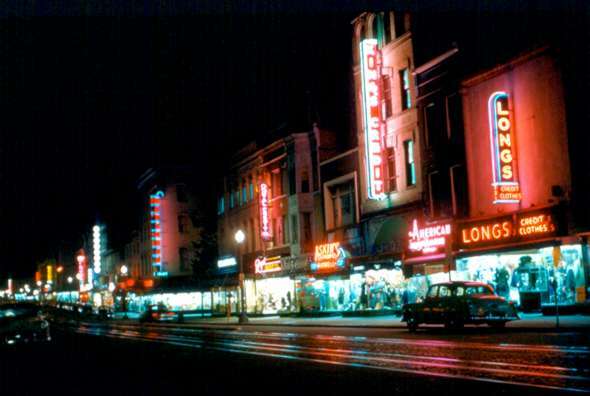 Some of the downtown stores along F Street in the 1950s. There were no shopping malls in Washington in the 1950s. All of the big stores were located downtown along the F Street corridor between 7th Street and 15th Street NW. Most of the people in the area lived either within the Washington city limits or nearby and a trip downtown only took about 20 minutes. There was frequent bus and trolley service covering most of the city. Notice what appears to be a third rail between the two sets of tracks. Downtown the trolleys drew their power from 2 electrified rails below the street. The above ground rails were not used to carry power. After reaching Georgetown the trolleys drew their power from overhead wires and the above ground rails were used to carry power. A man located in a chamber underneath Wisconsin Avenue would connect the lower trolley hook to the underground rails. The motorman would connect the roof trolley hook to the aerial cable. Automobile traffic on the trolley tracks would have to wait while this process took place. Thanks to William Pittman for clarifying the source of power in the downtown section of the city. Next - Downtown Washington Map.